Is Biking OK When Healing From a Pulled Hamstring? A pulled a muscle can be painful and frustrating and can interfere with your favorite physical activities. This can be especially difficult for a biking enthusiast, since the hamstrings are key muscles used in cycling. While you may be eager to get back to pedaling after suffering a pulled hamstring, it is important to properly treat the strain and allow it sufficient time to heal to avoid further damage and prolonged pain. What Did I Do to My Leg? A pulled, or strained, hamstring is usually apparent when you feel a sharp sensation in the back of your upper leg that makes it painful to continue exercising or prevents you from continuing entirely. This usually happens while doing strenuous exercise, especially if you are doing high speed movements, like peddling quickly. A strain occurs when you overload the muscle, causing micro-tears that can result in mild to severe discomfort. A strained hamstring occurs when any of the smaller muscles in a hamstring incurs one or more of these painful tears. Not all stained muscles are the same. They can range in severity and the associated pain they cause. Therefore, it is important to assess the severity of the strain so you know how to properly treat it and how long to wait before you can resume exercises that use your hamstrings, like biking. A pulled hamstring can fall into one of three grades. A grade 1 strain consists of only minor tears in the muscle. It will cause you to experience some pain, but you should still be able to walk somewhat normally. A grade 2 strain consists of partial muscle tears and will cause you to limp and have pain during activity. A grade 3 strain is the result of a sever or complete muscle rupture. It causes swelling and bruising, and you are able to walk only with the aid of crutches. The hamstrings are among the most important muscle groups used when biking, as they are responsible for the mechanics of pedaling. The upper parts of the hamstrings are used when you push the pedals down while the lower parts are used when you pull the pedal back up. Bending your body forward to position yourself for pedaling causes the upper part of a hamstring to stretch and the lower part -- that connected to your knee -- to stay bent. This positioning causes tension in the hamstring, making riding with a strain painful and subject to more damage. The amount of time you wait while allowing a hamstring to heal depends on the severity of the stain and how quickly you treat the strain. A grade 1 strain may allow you to start biking again within a few days if you follow the R.I.C.E (rest, ice, compress and elevate) protocol within the first 48 hours of injury. However, a grade 3 strain will require medical treatment and significantly more time to heal before it is strong enough to stand up to the pressure of pedaling. 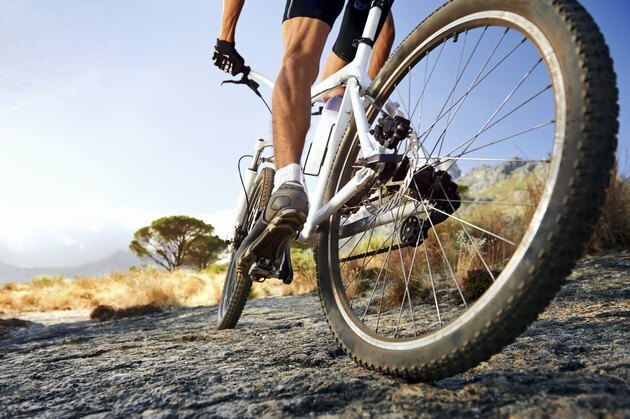 If you think you have strained a hamstring, have your leg evaluated by a doctor, who can advise you on the appropriate treatment and amount of time you should wait before biking.